The dropkick is largely similar to a volley. With the drop kick however, in contrast to the volley, the ball touches the ground during the shot. With a volley, the ball is never hit 100% at the optimal moment in time, with the dropkick even smaller fractions of a second will determine success or failure. 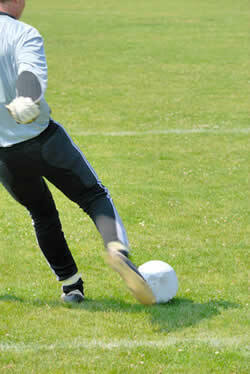 The drop kick is suitable for balls that have to be hit very far, therefore it is often used by the goalkeeper when kicking out of the hands. When drop kicking to score a goal, an unbelievable velocity is achieved and dropkick wide shots quickly become goal of the month. With some practice, the ball can be placed and played very well. Tempo and height are regulated by the amount of leg swing and through the surface area between ball and foot. The further the ball is hit lower down, the higher it flies. The power of the kicking leg is of no importance, it all depends on the correct technique. The best introduction to this technique is as follows: hold the ball with both hands–let it fall –dropkick. The next step is similar; there is a slight forward movement before letting the ball fall. If this is successful, the ball can be hit frontally by a team member. First, the ball is played back into the arms of the thrower and then the shot on goal comes later. The team mate should not shut himself off. If you wish to coach the drop kick with loads of passion, we here at Soccerpilot recommend the "Loops" drill. Simply insert a drop kick from different distances into the volley and it will do. A. The upper body is over both supporting leg and ball. B. The angled knee is over the ball. 1. The supporting leg is positioned a palm’s width from the ball. 1. The ball must be struck with the instepalmost simultaneously with the ball coming into contact with the ground. 2. Stretch the foot through and fix it in place, the toes pointing to the ground. 3. The ball is hit centrally with the instep. 4. The kicking leg swings through. 5. Support the swing with a forward motion after execution (run through). 1. Upper body leaning back. 2. The ball is hit before it touches the ground or too late. 3. The toes are not fixed, not stretched or not pointing to the ground. 4. The instep does not touch the ball centrally.